PulpFest 2013 is just around the corner, and so is the release of our new release Paperback Confidential. If you find yourself in the Columbus area stop in for "the summer's great Pulp Convention" and pick up a copy. If you can't make it, you can still order it from the Stark House website with FREEE SHIPPING in a cardboard mailer (just mention the newsletter in the note). These are the same terms we offer to our Crime Club members and if you're interested in signing up for that, drop us a line and let us know. 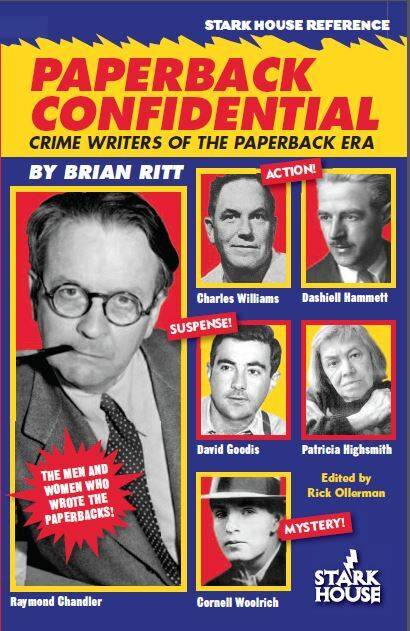 Even if you can't make the convention, check out their website for a ton of information related to these precursors and pioneers of the paperback original crime novel. 350 pages of un-put-downable reading. Bookgasm (yes, the same people who called me "Rock" Ollerman) said "Stark House has put together what has to be reference book of the year." We certainly think so. It's safe to say that the time and effort taken to get this book into print far surpasses any book we've ever done. It's a huge undertaking and hopefully all the loving work results in a payoff, not in the Hammett or Frederick Nebel way, but in the readers' satisfaction way. Brian Ritt and I appeared on Ric Croxton's Book Cave podcast a week or so ago for a lively hour and a half talk about the book, the authors, and some of the stories of how many of the authors are more interesting than the stories they wrote. Check it out.. 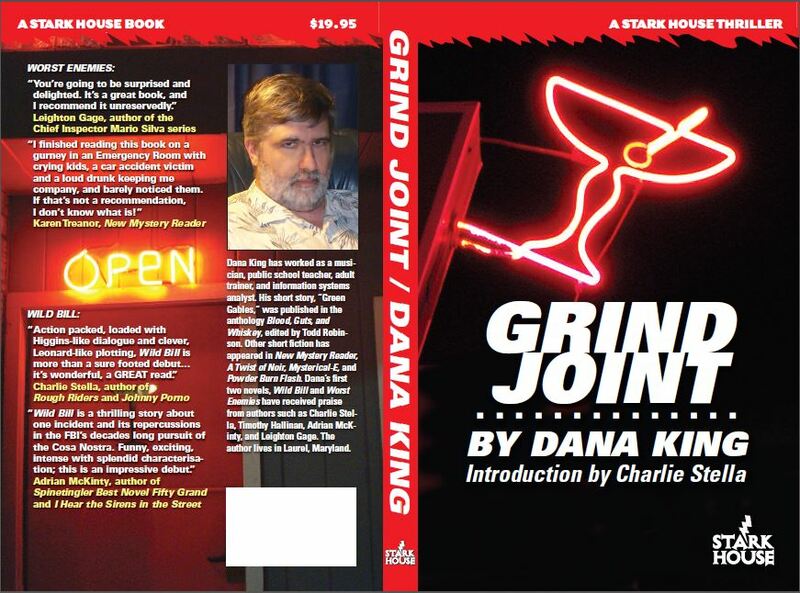 The Book Cave does a lot of podcasts that would be of interest to Stark House readers, and we hope to be on there again with Dana King and the great Charlie Stella discussing Dana's upcoming release Grind Joint as well as mob fiction in general, hopefully a great story or two from Charlie (can mention of George V. Higgins be avoided?). I also spent a lot of time in Minneapolis bookstores last week talking to legendary booksellers like Don and Elizabeth at Uncle Hugo's and Uncle Edgar's and Gary Shulze at Once Upon a Crime. As knowledgeable as anybody in the business, I'm very grateful for all the time they gave me, talking about publishing, books, and showing off some of the treasures they have jamming their shelves. The first time I stopped in and spoke with Gary, I told him about how some gentlemen had asked to take my wife's picture one day at Clearwater Beach in Florida. I was foolish enough to be off getting us something cold to drink so I only saw this from afar. She shrugged it off, saying it happens now and then. Oooookay. Anyway, fast forward a few years and a well-known publisher of crime novels comes out with a paperback edition of a book featuring guess who? A women with the same bikini, the same beach towel, the same sunglasses, the same physical appearance, the same hair, a couple of identifying characteristics, all gracing the cover of this particular book. The shot was taken from the same spot the gentlemen stood when they took said picture. The only thing not there is me tripping through the sand carrying two dripping Coca-Colas. When we stopped in on our way to the airport, Gary looked up and said, "I know you." I thought for a moment he was talking about me but he seemed to be looking at my wife. He went to the shelf, picked his copies of said book off the shelf, handed her a pen, and asked her to sign the books with the words, "Cover girl." I may not look that good in a bikini but is it really fair that she's signed more books than I have?